Bruce Springsteen wasn't thinking about Wendy when he wrote a first draft of his 1975 classic "Born to Run." Instead, he's got a gold Chevy 6 on his mind, according to the original lyrics, which make their public debut this week at Duke University. The 30 lines of lyrics, written in pen on a piece of 8.5-by-11-inch lined paper, were purchased last December at a Sotheby's auction by Floyd Bradley, a California man whose daughter graduates this weekend from Duke, as does Springsteen's daughter. Bradley, 62, a retired computer software marketer who spent much of his life in London, paid $160,000 plus a commission, bringing the total to $197,000. "It was a lot. I was embarrassed to tell my children," he said. "But they were very supportive after I told them." He bought them as an investment, he said. "It's a piece of Americana, I think." The original lyrics, written in 1974, in Long Branch, N.J., bear little resemblance to the anthem that Springsteen typically plays each concert with the house lights on and the audience on its feet. But that familiar chorus of "tramps like us/baby we were born to run" is there as is a part that ended up much like the final version: "this town'll rip the bones from your back/it's A suicide trap/your dead unless you get out while your young." The "everlasting kiss" is there: "I was headin for the place where wild Angels die in An everlasting (or) neverending kiss." But there's no mention of dying with Wendy during that kiss or of guarding Wendy's dreams and visions. Instead, Springsteen "looked out cross my hood + saw the highway buckle neath the wheels of A gold Chevy 6." The car got a second mention a few lines down: "Baby out there heroes are crushed to death behind the wheels of a gold Chevy 6." In the margins, he's written words such as "wild angels," "Stroll on!" and "the rebels." "Something as iconic as this song, it's going to be important to American history," said Duke University exhibit librarian Meg Brown, who found 25 books about Springsteen, mostly academic, in Duke's collections. "It came in at a time with a lot of change in American history and it made a significant difference." Bradley's life has intersected with Springsteen's at times. His mother, Carol, lived beside Springsteen's mother, Adele. 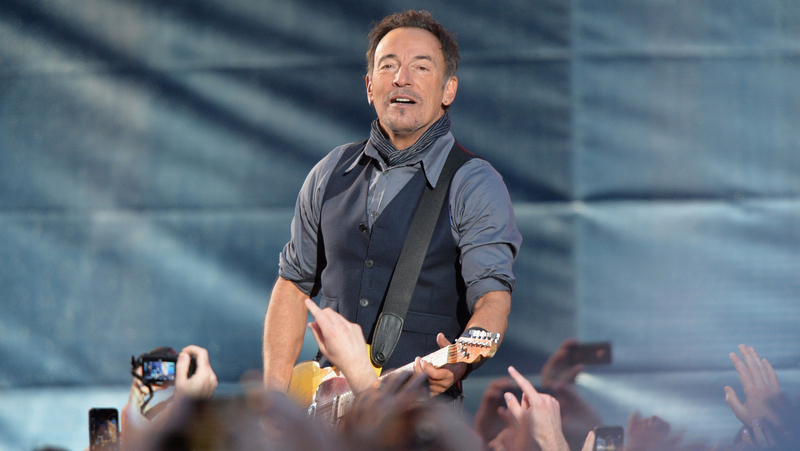 When the family sold Carol Bradley's house, Springsteen bought it for his mother-in-law. And Bradley met Springsteen once when he took something to Adele Springsteen and she invited him to meet her son, who was visiting. Carol Bradley also wrote and sang a song titled "The Big 50" for Springsteen's 50th birthday, and Springsteen played the recording of Carol Bradley singing the song at a concert in Philadelphia in 1999. Bradley's daughter, Melissa, graduates this weekend from Duke as does Jessica Springsteen. He hasn't reached out to Springsteen to set up a meeting, however. "But I might bump into him ..." Bradley said. The lyrics will be displayed starting Thursday and continuing through Saturday at the Perkins Library. Then the sheet will move to the David M. Rubenstein Rare Book & Manuscript Library at Perkins from May 12 to June 27.